IVibration turns the iPhone into a personal massager. By utilizing the phone’s vibration function, the user can select from eight different vibration levels to relieve tension and stimulate nerves. Use it on pressure points, lower back, neck, head, and any other areas that need a little release. Although there are several vibration applications currently available, iVibration offers a unique and simple user interface alongside access to several different levels of vibration. BikiniQuest is the first iteration of Five Star’s take on the classic photo hunter games in arcades and bars throughout the country. The user has 10 seconds to find the differences between two similar images, shown side by side in the landscape view of the iPhone. The first in a series, BikiniQuest focuses on images of beautiful women in bikinis. Check back for more updates in Five Star Apps’ “Quest” Series! Studies have shown that large packages of junk food activate a person’s dieting concerns. Once these concerns are felt, a person tends to fight the urge to snack on junk food (hence the fun size bags of potato chips!) iChew is an application based on these inclinations. iChew will satisfy cravings for several types of junk foods from pizza to gummy bears. The user simply selects a type of food, and the image of that food comes into the landscape mode of the iPhone. 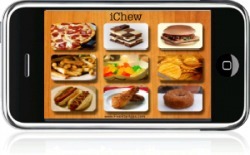 Each time the user taps the image, the iPhone “chews” the food and shows the detrimental nutritional value of each bite. We plan to release other versions of iChew in a series, so please check back often! iCrack is an application which uses the hardware functions of the iPhone to simulate glass breaking on screen. When the user clicks on the application, an image of a wine glass and wine bottle appears on screen. When the user then touches the screen, the screen appears to shatter at the point where the user touched the screen. In addition to the screen shattering, the speaker emits the sound of glass breaking.